Thousand Oaks Optical's Four Channel Digital Dew Heater Control Unit # DDHC - Compared to competitor's models, it is like getting four controllers in one! FOUR CHANNEL: Each heater output is controlled independently and has a full range of adjustment from 0-100%. This eliminates the problem of overheating or not reaching desired temperature regardless of heater size and combination. Green LED indicates unit is receiving power and also serves as a low power warning in "battery saver" mode. Each channel has it's own red LED indicator. Compared to competitive models, it's like having four units built into one box with advanced features. Unit is small and lightweight measuring 5" x 2.5" x 1" (127mm x 63 x 25). Supplied with 12' (3.65m) power cord and cigarette lighter adapter. DIGITAL: Latest state of the art circuitry with microprocessor. Pulse width modulation and microprocessor provides stable output for precise temperature control. Without this control, output voltage can "wander" due to moisture, temperature changes and age as seen with competitive models. FULLY PROTECTED CIRCUITRY: Fuse and diode protection for surge or reverse polarity. Please note that this item requires a 12V DC power supply with a cigarette lighter jack for operation. It includes a cigarette lighter adapter with a 12' (3.65m) long cord for connection to such a supply (for example, a car battery or portable field battery). It does not include a converter/adapter or cannot be operated from standard AC power sockets. Dew heater strips / bands for actual heating of optical elements are sold separately and are not included with this controller. 4.9 (Based on 10 Reviews) 100% of reviewers recommended this product. I have used this a few times already, since getting it. It works flawlessly. Keeps three dew strips warm and toasty, preventing dew from forming on my optics and finder. It is a nice square case as opposed to the Kendrick odd shaped dew heater controller. 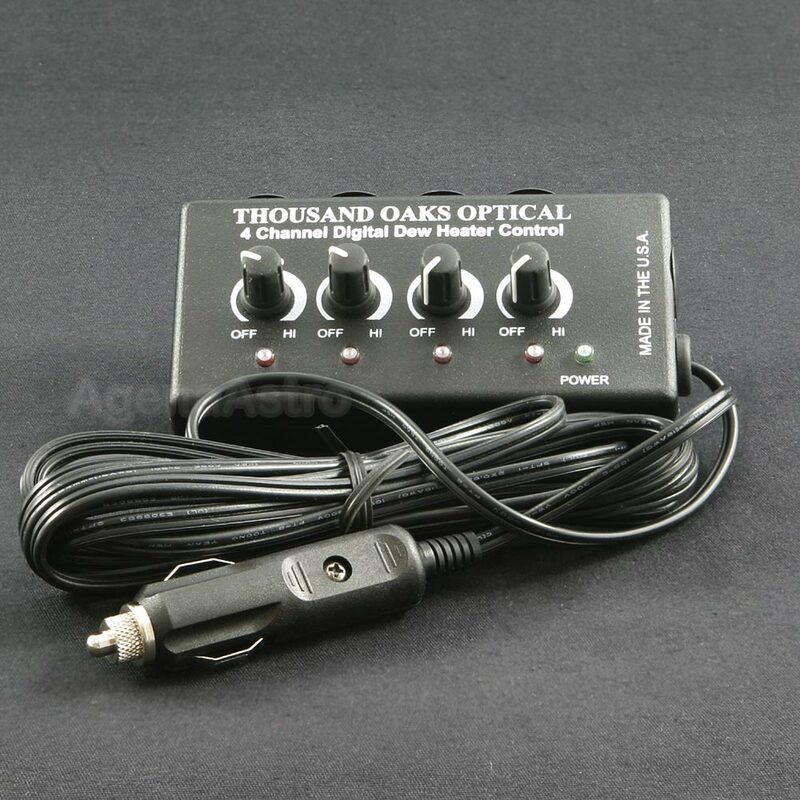 It is light weight, easy to use knobs and 12 foot long 12vdc cable and plug. 5.0 Works like it&#x27;s supposed to! Works like it's supposed to! Keeps the dew off up here in Canada! 5.0 works great.. small unit size..
Love the four-channels with the plastic plugs to cover the unused ports. Works fine! The long power cord keeps the power supply from underfoot. Review by sinsonte of WV. I use both this for both dew heaters (using the knob controls) and to provide constant 12 V (using the auxiliary outlet) to an electric focuser. Works well in both case. I appreciate the long power cord. Review by gunsmokeray of Louisiana. Review by Stefan of Melbourne, Australia. This is a fantastic little product to connect all of your dew equipment to. Gives you 4 plugs which is plenty for future expansion.